Facility Guide - Communication Plaza | Yamaha Motor Co., Ltd.
Information on open hours, floor layout and more. 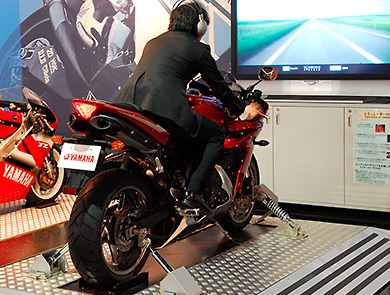 These Plaza open days are based on Yamaha Motor’s working days. Please be aware that parts of the facility and/or the Café may be closed as circumstances require. The Plaza is open on the 2nd and 4th Saturdays and the following Sunday of each month. Please be aware that the opening time is different. 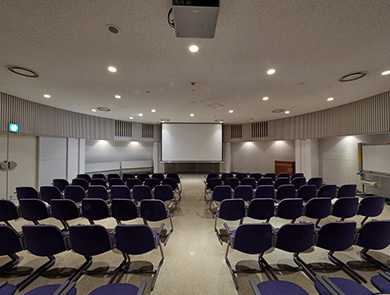 Use of the meeting room is possible by Yamaha Motor product user clubs for meeting purposes. When visiting the Plaza with 11 or more people, a reservation is required. Please fill in and submit the reservation form at least one week in advance. See the Group Visit reservation page below. Eating is allowed only in the Plaza Café (3rd floor). Please do not eat in other places. There may be some cases where the Plaza Café is completely reserved. Diaper changing seats can be found in the wheelchair-accessible restrooms (1st and 2nd floor). Please contact the reception desk if you require a wheelchair. No pets are allowed into the Communication Plaza. 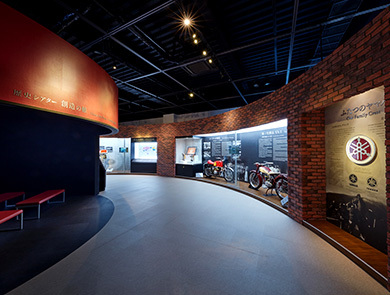 The Communication Plaza is Yamaha Motor’s corporate museum, but is not staffed to provide individual responses to specific inquiries by phone or at the reception desk. These include questions concerning technical details about Yamaha models, where or how to purchase parts, current or older Yamaha models, and business negotiations. We also do not relay such inquiries to other divisions at Yamaha. We ask for your understanding and cooperation, and thank you for your interest in the Communication Plaza. When visiting the Plaza with 11 or more people, a reservation is required. Please fill in and submit the reservation form at least one week in advance. 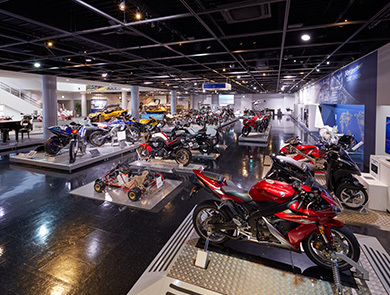 Representative products from Yamaha Motor history and their modern equivalents are on display here, from motorcycles, marine products and recreational vehicles to electrically power-assisted bicycles and automobile engines. 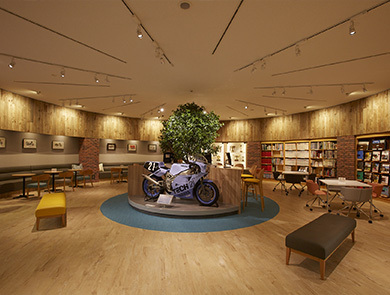 Here, visitors can see models from the full range of Yamaha products, beginning with the motorcycles and scooters used and loved by people around the world. Also on display are boats, outboard motors, snowmobiles, ATVs, automobile engines, electrically power-assisted bicycles, electric wheelchairs, golf cars, an industrial-use unmanned helicopter, generators, industrial robots and more. Introduced here are Yamaha technologies and how they are used across our wide range of products, primarily with the motorcycles that represent our main line of business. 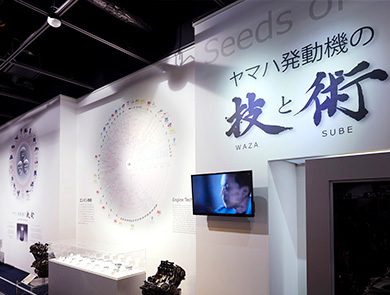 Themed mini-exhibitions are held regularly in this area. 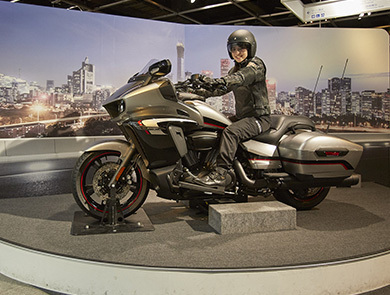 The designs of our products and concept models, and other Yamaha-led design activities and initiatives are introduced here along with information about the points that make them unique. Like the Technology Zone, themed mini-exhibitions are held regularly in this area. This area is where exhibitions highlighting products and how and where they are used, etc., are held. 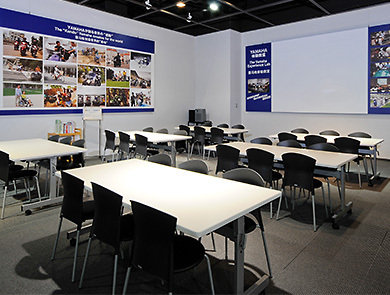 A variety of simulators, models that visitors can sit on and video monitors can be found at various exhibit areas to offer visitors virtual experiences as they learn about our products. This space is for hands-on learning activities and other educational events for children. 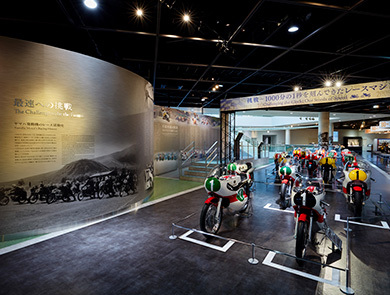 This room is for giving presentations about the history and overview of Yamaha Motor to tour groups, etc. 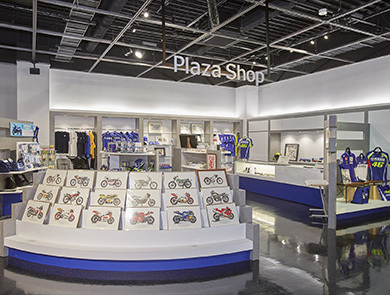 At this shop located to the right of the entrance area, a large selection of items is on sale, including original Yamaha goods that will make perfect souvenirs of your visit. 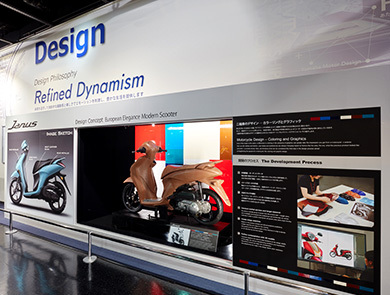 Introduced here are Yamaha Motor’s beginnings: learn about how the company was founded; the meaning behind the Tuning Fork Mark; Yamaha's first motorcycle; the challenge of racing that has been a part of Yamaha DNA since its founding; the spirit of the founder and first president that lives on today; the path taken to diversify and globalize, and more. In addition to the informative displays, you can view related footage in the historic film theater. 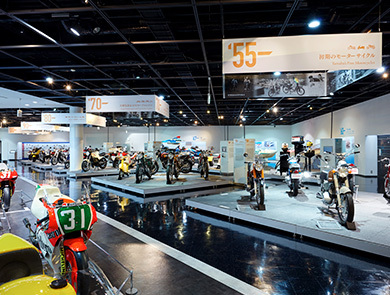 This area introduces Yamaha’s history of challenge in the world of racing that began soon after the company was founded. Here you will find historic models and trophies from various racing categories, and a timeline of achievements spanning over 50 years of competition. There are also touchscreens to view commemorative publications, and race-related video footage is shown on the main screen. 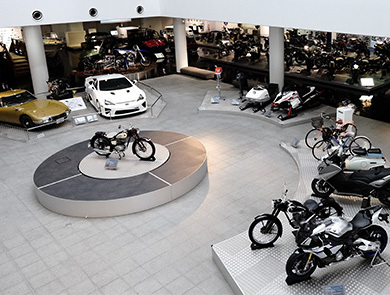 This area displays historic Yamaha models and products from the company's beginnings up to today, including motorcycles, marine products like boats and outboard motors, recreational products like ATVs, generators and other power products, and automobile engines. Visitors can also browse various kinds of digital content here. As a policy, the models in the Plaza collection are kept in running condition. In the Plaza Lounge you will find past product pamphlets and Yamaha publications (PDF format) and historic film footage accessible on touch-screen monitors. There are also magazines specialized in motorcycles and marine/boating products to view. There are outlets to charge your cell phone and you can enjoy beverage take-outs from the Café in the Lounge as well. 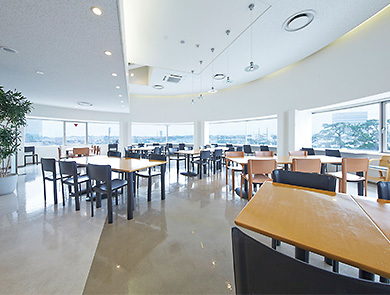 In the café, you can enjoy local-brand soft drinks and light meals with a view of the Enshu mountains in the distance. Feel free to use it as a place to rest and enjoy conversation during your visit to the Plaza.